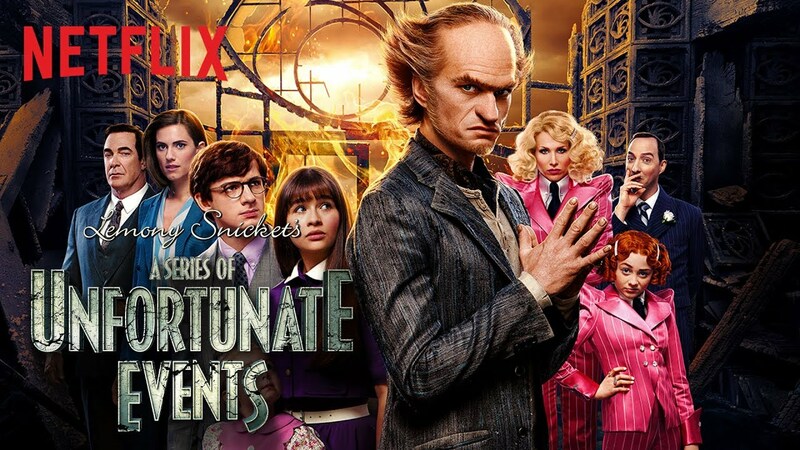 A Series of Unfortunate Events comes to an end with this final season delivering the final seven episodes based on the last four books in the series. It’s sad to see such an incredible series end but it does so in a way that is extremely satisfying and rewarding for those that have stuck with the Baudelaires through all of these unfortunate events despite Lemony Snicket’s (Patrick Warburton) countless warnings. Structure-wise this season doesn’t veer much from the previous seasons in that every two episodes covers the story of a single book with the exception of the last episode. But that is no criticism. This formula still works in how it fantastically tells new shorter stories within a larger story without compromising either one. However, I feel like this novelty would have worn off if this season wasn’t also setting the stage for the finale which I must say I also thoroughly enjoyed. Each episode as well as telling the localised stories has its eyes set on the end and that’s clear from the get-go. The entire season has this feeling like it’s all coming to an end. New characters are introduced with the impression they’ll play a major role, old fan-favourite characters return for one final moment in the spotlight, and all of the age-old mysteries start to come to light as it all wraps up. As much as I love what they do with the ending it may give some fans a somewhat bittersweet reaction. As much as I thoroughly enjoyed this season, if I was to rate it in comparison to the last season I’d have to say I didn’t enjoy it quite as highly as I did the last. What I feel it all comes down to in the end is how it all leads up to the finale. I enjoyed the route it takes and I enjoyed what we get once we get there but throughout the season it did feel like rather than building towards an explosive finale it was building towards a more safe finale. Now I can’t necessarily complain about that, a safe finale is a good one and this season wraps everything up with a nice little bow whilst not forgetting it is a series of ‘unfortunate’ events. But some of the excitement that could have been there wasn’t which might be why I’d still place season 2 over this one. One element of the series which is still just as phenomenal as ever is the intricate writing which goes into every single episode. The crafting of each and every line of dialogue is magnificent in how it all connects and links not only to the common themes or topics within the episode but to things linked with specific characters and lines from previous episodes. The dialogue is all so smart from the random quippy quotes that garner a good laugh to Lemony’s narration in which you might learn a thing or two about the english language. I love it as it greatly rewards those who pay attention to every moment and adds another layer to the series. The story of every episode is so tight and contained but also so connected to the wider universe that it’s impressive in how it’s all pulled off. Each episode can introduce and feature new characters both good and bad who you feel like you know despite only just meeting them then and there. This level of interconnectedness not only enhances how the story is told or how the dialogue is received but also how the comedy and humour is delivered. There’s a some subtle visual comedy, and some obvious attempts at hart hitting jokes but the real quality humour comes naturally through the intelligent dialogue that catches you off-guard. The dialogue is so quick from every character that a lot of the humorous lines are very ‘blink and you’ll miss them’ sort of things but the satisfaction from picking them up is like no other. It’s quick, it’s witty, and it’s unique in how the style of humour here can be so dumb but also so intelligent at the same time. That must be why I respond to it so much. The performances this season are top notch just as before from both the main recurring cast and the secondary cast. The young Malina Weissman and Louis Hynes who portray Violet and Klaus Baudelaire have grown with their characters over the years and they’ve become synonymous with the roles by now. By this season they have such a great grasp on their characters’ personalities and what makes them tick that it makes watching them all the more enjoyable. Speaking of growing into their character, Presley Smith who has portrayed the young Sunny Baudelaire since season 1 has grown so much that I believe this season she is even credited as the voice of her character where previously Tara Strong had that job. Much of her actions may be aided by cgi but it’s great seeing the young kid have fun in the role. But I mean, the star of the show is no doubt Neil Patrick Harris as the nefarious Count Olaf who continues to astound me with how synonymous he is with the character as he literally disappears into the role. So many of the great moments come through Harris to where without him this would be a ‘series of fortunate events’ and we can’t have that. Some of the more featured supporting roles this season include Lucy Punch‘s infuriatingly fun Esmé Squalor and Kitana Turnbull‘s just straight up infuriating Carmelita Spats. They bring some more diversity to the villains of the season which is a change of pace from Olaf’s usual henchmen. The presence of the Snickets in the form of Kit (Allison Williams) and Lemony is always a pleasure as this is in part their story too. Allison Williams is a star in this season and I thoroughly enjoyed every second she is on screen because she brings this energy to all of her scenes no one else can. She’s the best new addition to the season. So with that we close out a wonderful series with a finale that does the entire three seasons justice and puts out a delightfully satisfying ending. Everything in this series that was good in the beginning has only continued to get better and this is not a series I will forget anytime soon. This season was thoroughly enjoyable in the lead-up to the end and I can see myself rewatching it and the previous seasons at some point in the future. I absolutely recommend this show to anyone who would appreciate its style of humour as it’s well worth the unfortunate adventure.